A BLEND OF SWEET WITH HEAT! This deliciously sweet smokin' hot chipotle is a lot more exciting because we've blended farm fresh chives, onions and added choice habaneros to ensure each bottle has a spicy kick. 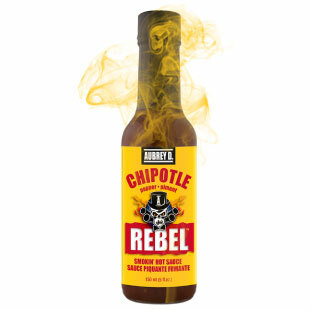 When you need to bring the heat in your cooking just think Rebel! Aubrey D. and the Rebel line of hot sauces gives you a pallet of colorful favor that will solve any of your heat desired meals. Prepare yourself for a rich tasting heat that will sting your tongue and bring tears of flavorful goodness.